inscribed angles and central angles. a circle theorem called The Inscribed Angle Theorem or The Central Angle Theorem or The Arrow Theorem. We will first look at some definitions. Property: The inscribed angles subtended by the same arc are equal. ∠x = ∠y because they are subtended by the same arc AEC. Property: The inscribed angles in a semicircle is 90˚. POQ is the diameter. ∠PAQ = ∠PBQ = ∠PCQ = 90˚. A central angle has its vertex is at the centre of the circle. In the diagram below, ∠AOC is called a central angle. Property: Central angles subtended by arcs of the same length are equal. How to use the properties of inscribed angles and central angles to find missing angles? (1) Central angles subtended by arcs or chords of the same length are equal. (2) If two inscribed angles subtend the same arc or chord, then the angle measures are equal. A central angle has its vertex is the middle of the circle. 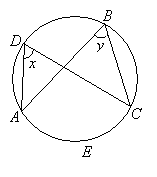 An inscribed angle has one endpoint on the edge of the circle and then cuts across the rest of the circle. The vertex of its angle is on the circumference. Any inscribed angle that ends on the same two points has the same measure unless the vertex is on the minor arc. If their vertices are on opposite arcs then they are supplementary. Any inscribed angle whose endpoints are a diameter is a right angle, or 90 degree angle. The Central Angle Theorem states that the inscribed angle is half the measure of the central angle. In this video, we can see that the purple inscribed angle and the black central angle share the same endpoints. If the inscribed angle measure x, the central angle will measure 2x. For example, if the central angle is 90 degrees, the inscribed angle is 45 degrees. Now, we will look at the Inscribed Angle Theorem. It is also called the Central Angle Theorem or Arrow Theorem. An inscribed angle is half of a central angle that subtends the same arc. The angle at the centre of a circle is twice any angle at the circumference subtended by the same arc. The center of the following circle is O. BOD is a diameter of the circle. Find the value of x. Basic definitions: Chord, segment, sector, tangent, cyclic quadrilateral. Theorem: Angle subtended at the centre of a circle is twice the angle at the circumference. The angle inscribed in a semicircle is a right angle. This video proves the theorem that an inscribed angle is half of a central angle that subtends the same arc. The central angle is twice the inscribed angle that subtends the same arc.